Allen West and the Allen West Foundation Toys for Tots Event | Help Give to our Families in need. As we give toys to children in need this Holiday! Monday, December 9th: 1:00 p.m. to 4:00 p.m. Please bring an unwrapped new toy! **Please note: If you cannot attend in person you may mail/ship an unwrapped new toy to the address above. Forty years ago, 72% of House lawmakers and 78% of those in the Senate had served in the armed forces. Veteran representation on Capitol Hill has been steadily declining since the early 1970s, largely a result of the World War II generation steadily leaving public office. But those who have served in the military have a better understanding and a deeper comprehension of issues involving national security, armed services and veteran issues –issues no less important now than they were 40 years ago. Colonel West was one of only four black Republicans to serve in the United States House of Representatives in nearly a century. In the Senate, there have been only two. As the demographics of the U.S. population shift, it becomes ever more critical to increase representation by not only black, but Hispanic and Asian American leaders as well. The leadership PAC Colonel West established during the 2012 election cycle with the same mission helped 7 military veteran candidates win their seats in the House of Representatives. We must ensure conservative leaders are elected who will stand as guardians of our constitutional republic, to restore our nation’s fiscal responsibility and strong national defense, limit the growth of government, unleash the free market and preserve the liberty and sovereignty of its citizens. Allen West Foundation | Sponsor an event in your city, here’s how! 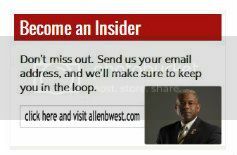 Are you interested in sponsoring an event in your city to benefit the Allen West Foundation? Host a Breakfast, Lunch or Dinner event in your home or a larger social event at a local venue! Lt. Col Allen West visits with JROTC units all over the country to foster conservative leadership skills in conjunction with Allen West Foundation events.